Oracle has created the Oracle Exalogic Elastic Cloud, a private cloud appliance for Oracle, Java and non-Java applications, and Amazon has announced support for many Oracle products. Following Larry Ellison’s amusing vision on cloud computing that “all it [cloud] is, is a computer attached to a network”, Oracle has launched a cloud appliance called Oracle Exalogic Elastic Cloud, serving the needs for a private cloud. Exalogic hardware comes as a cabinet holding standard 19” 42U racks, each unit containing a number of hot-swappable nodes, a SSD-based storage system, the InfiniBand I/O fabric for both internal communication between nodes and external communication with other units, and several 10-Gigabit Ethernet ports for integration with the datacenter. Each node has 2 6-cores 64-bit x86 processors, ECC DIMM memory, two SSDs, redundant InfiniBand Host Channel Adapters, and power supply. According to the specifications (PDF), “all Exalogic configurations are fully redundant at every level and are designed with no single point of failure”, providing “near-instant failover and 100% isolation” for applications. An Exalogic cabinet comes with 8, 16, or 30 racks, having between 96 and 360 2.93 GHz Xeon cores, and if that is not enough 8 such units can be grouped together for more processing power. 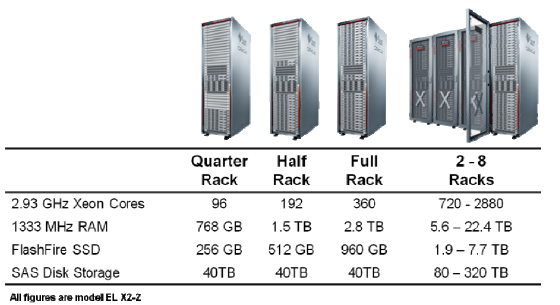 Oracle affirms that Exalogic scales linearly horizontally due to its InfiniBand connections. On the software side, Exalogic uses Oracle Linux or Solaris 11 running on Oracle VM and supporting all major Oracle middleware products, and many Linux/Solaris applications. 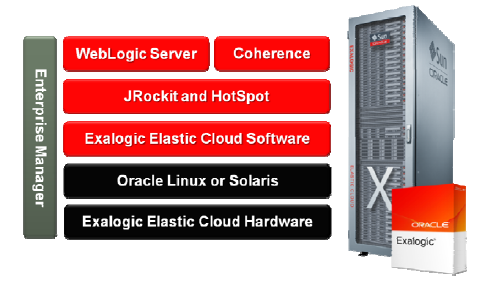 Exalogic is integrated with Oracle Database 11g, Oracle Real Application Clusters and the Oracle Exadata Database Machine. On the performance side, Oracle boasts that one rack can serve over 1M HTTP requests/s and can process over 1.8M Java messages/s. The applications will be provided as AMI, and one will be able to run them using the existing Oracle licenses. It looks like Amazon targets low level Oracle customers looking for a cloud solution, while Oracle goes to the big customers which can afford the price of an Exalogic machine. Larry Ellison mentioned during Oracle OpenWorld keynote that China runs its entire railway ticketing system on one Exalogic and one could run the entire Facebook web layer on a couple of those, making Dennis Howlett, a ZDNet journalist, ponder why would Oracle create such an appliance because “maybe, just maybe, 5% of Oracle customers are likely to use”. The idea is that Exalogic seems to be more powerful than most need, but it is suggesting Oracle is preparing itself for a public cloud offering which Sun attempted in the past without much success with its Sun Open Cloud Platform.